With the economy putting a strain on disposable income, I suspect cigar makers are going to find it increasingly difficult to sell pricey sticks at the rates they’re used to. Sure, the truly magnificent cigars will always find a home. But as for the endless stream of “premium” and “ultra-premium” cigars, manufacturers are going to have to offer cigar enthusiasts more if we’re expected to dish out that much on a regular basis. Fortunately, that model already exists. Perhaps not surprisingly (because many aspects of cigar culture are already borrowed from wine) that model is wine. The popular ratings systems we’re accustomed to were adapted from wine ratings, as was much of the terminology that we use to describe how cigars taste and smell. When it comes to wines, particularly the best (with the exception of champagne), there is no escaping the fact that wines vary from year to year. While wineries strive to consistently make good products, changes in climate yield changes in grapes over time. The same is true of tobacco. Yet most cigar makers pretend their creations made from tobacco from varied seasonal conditions will end up tasting identical. All this despite the fact that many consumers are sophisticated enough to realize that, like wine, the high quality tobacco that makes up premium cigars won’t be identical in taste from year to year. While far from universal, wine makers are much more forthcoming with information about their products. Vintages, origins, breakdowns of the blend—all are regularly found on bottles of wine, and making some some or all of that information available to consumers would greatly benefit the cigar industry, too. Wine is as much identified by the varietals of grapes (such as pinot noir or shiraz) as by the region or vineyard. But the types of tobacco (and in what proportions) are rarely disclosed by cigar makers. Pulling back the curtain of cigar blending may seem like a risk, but I think the increased information will make more smokers into connoisseurs. And as they understand the complexity of today’s finest cigars, they will grow more likely to shell out money for the finest blends. Some wines are made to drink soon after production and some need years or even decades before they are at their best. Aging cigars certainly isn’t unheard of. Many top collectors and connoisseurs patiently age their smokes despite an unspoken hostility by much of the cigar industry. Like the difference between vintages, cigar makers often pretend that their cigars are at their best from day one. But we’ve all experienced cigars that need six months or more before they reach their peak and others that benefit from years of aging to fine-tune their subtleties and complexities. If cigars embrace the fact that not every cigar will be at its peak immediately upon release, I think they’ll find that many smokers will welcome their frankness and reward them by purchasing more of the best premium cigars for extended aging. Great commentary. Readers might also want to check out Doc Stogie's petition drive (http://www.stogiefresh.com/petition/) to get more info from cigar makers. Wow, what a great commentary. I completely agree, more information will allow me to educate myself more on the brands and cigars that I enjoy. Like you said it will only allow you to appreciate the time and effort that goes in to the cigar. Great commentary! Now that's what I call hitting the nail on the head! 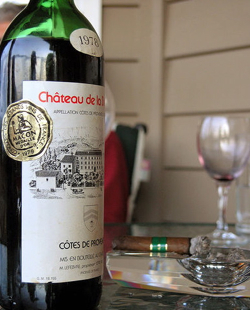 As both a wine and cigar lover (I often pair the two unlike many people I talk to), I haved hoped for some time that cigar manufacturers would offer the type of detail about their creations that wine makers do. It would also be nice to see cigar manufactures label their cigars with general but more detailed information about the "smoking experience" one might have with a particular cigar as wine makers do. I have certain taste preferences that I shop for in wine and would struggle quite a bit more with my choices if all I had to go by was a description of medium or full bodied as the description. Thanks for all the great work you do on this site! I think that the difference between the wine and cigar industries is that most wine companies sell wine made from grapes grown on their own estates and produced in one area. The cigar industry has many growers and producers that buy and sell tobacco from each other and create blends that may originate from several different regions and countries from all over the world. I think that cigar manufacturers like to remain quiet because they may be buying the same tobacco that their competitors are using and they wouldn't want the consumer or their rivals knowing that. I agree with you, and this is the reason I like Cuban crafter s" details". How ever I guess manufacturers have the right to keep there secret blends hidden "copy Rights"
Thanks for all the kind words about the commentary. George- I do think that Doc's petition addresses much of this, although I'd make one small caveat to the petition's demands: I don't think standardization (as Doc wants) is needed so much as simply more information. With wine the information varies greatly, but virtually every wine maker has considerably more information than all but a few boxes of cigars. Very nicely done Patrick! The wine industry is way ahead of the cigar industry in systematically educating the wine consumer. And, it has paid dividends in increased wine consciousness and more people choosing to become hobbyists and collectors. It also helps justify the higher prices, when you understand all the processes and complexities that go into making a bottle of wine. As for standards, there will need to be some standards. For example, what does "vintage" mean when applied to cigars? For some it is the year the wrapper was harvested (e.g., Perdomo Estate Selection Vintage 1991) For others it refers (loosely) to the age (in years) of the wrapper leaf (e.g., Rocky Patel Vintage 1990 and 1992). For others it is the harvest date of the filler and binder tobacco (e.g., Bahia Vintage). And yet for others, vintage is the release date (LG Diez Vintage 2008). This is a moving target that will continue to confuse cigar consumers and will continue to render the term meaningless.